When Nissan purchased a controlling interest in Mitsubishi, Lance Evolution fans were hopeful, the Japanese automaker would revive the high-performance sedan. But it looks like Nissan has no plans to bring back the rally-bred EVO, at least not as a sedan. Nissan would rather put their R&D into the small SUV segment where sales are exploding in the U.S. and around the globe. New Outlander sales are up, and it’s where the market is headed. Nissan isn’t about to pour money down a rat hole and bring back the aging Lancer Evolution. It would need a total remodel since it hasn’t seen any major overhaul since 2008. Americans aren’t buying sedans is one reason, and automakers are pouring their research money into developing new plug-in hybrid and all-electric technology. There’s been reports that Mitsubishi would put the EVO nameplate on a new PHEV instead of bringing back the Lancer Evolution. This is more likely as the Mitsubishi brand has been heavily involved in developing this technology. There’s a new automotive term called eco-performance and it’s going to change the auto industry in a big way. The technology was featured in Mitsubishi’s newly developed FF-type Plug-in Hybrid EV System and we saw it in their Concept XR-PHEV. It’s being developed for a new-generation of urban buyers who want a dynamic and spirited driving experience, but with new fuel-efficient technology. The Mitsubishi Lancer Evolution is dead and it’s not coming back. If you still want a new Lancer EVO, there’s one available. Brooklyn Mitsubishi is selling a new #0001 2015 Final Edition, the very first FE produced. 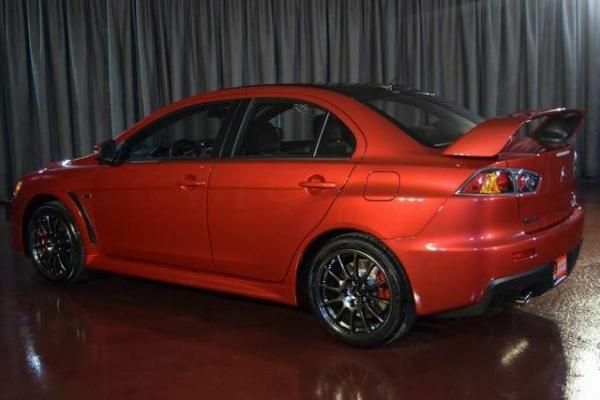 It won’t come cheap as the Mitsubishi Dealership is selling the Rally Red EVO for $87,888. The vehicle was purchased by Brooklyn Mitsubishi with all proceeds going to The National Multiple Sclerosis Society.